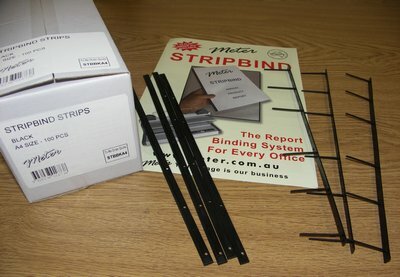 Meter A4 Stripbind Binding Strips are used in conjunction with the STBA4 Stripbind Binding System. Each Box of Stripbind strips contains 100 pronged strips and 100 closing strips – enabling 100 documents to be bound. The strips are 6 prongs that are fed through the holes in your paper that have been punched with the A4 Stripbinder Binding Machine. When used in conjunction with A4 Stripbind Binding Covers the Stripbind Strips create professional looking documents in seconds. Strips are a available in Black, Blue and White colours.